A dinner salad was a must on this week’s menu. The temperatures have been in the 80s and the days are getting longer and longer. A perfect reason to enjoy a cool, flavorful salad with grilled chicken. 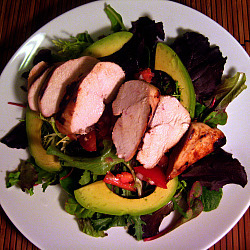 I browsed through the grilled chicken salad recipes from Gourmet on Epicurious and this salad was the standout. It was super easy to prepare – the chicken only has to marinate for 15 minutes and while it’s grilling you can prepare the tomato mixture and plate the salad. This salad is a great healthy and quick option for a weeknight dinner. Our Easter weekend was awesome! 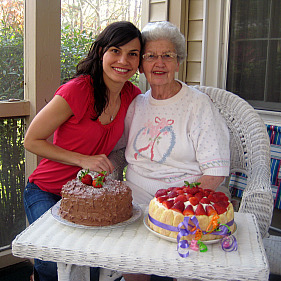 We celebrated my grandmother’s 80th birthday (say happy birthday to Mema – she reads the blog!!!) and cooked up a storm. I baked my favorite Lady Strawberry Cake and the crowd pleasing Chocolate Cake with Chocolate Cream Cheese Frosting. I can’t resist sharing this picture of Mema with her TWO birthday cakes! I’m teaching FOUR BodyPump classes this week. I predict that I will be sore by the time Sunday rolls around. We’re teaching the new release and it’s really tough – the squats and lunges make me want to cry! And I have some news for you guys…I am going to register for the Marine Corps Marathon tomorrow. I’m so nervous to commit to a race that is 6 months out but it’s a big goal of mine to run a big city marathon and I’ve heard great things about this race. I’ll start slowly building my base in the coming months and really ramp up my training in July. Ahh! I can’t believe I’m 100% committing to another marathon. Whisk together lime juice, honey, red pepper flakes and 3/4 teaspoon salt in a large bowl. Add oil in a slow stream, whisking. Transfer chicken to a 1-gallon sealable plastic bag and add 1/3 cup lime vinaigrette, then seal bag. Marinate chicken at room temperature 15 minutes. Transfer another 1/3 cup lime vinaigrette to a bowl, stir in tomatoes and shallots, and marinate until chicken is finished cooking. Transfer another 1/3 cup lime vinaigrette to a large bowl and set aside for cooked chicken. Remove chicken from bag, discarding marinade, and sprinkle all over with remaining 1 1/2 teaspoons salt. Open vents on bottom of grill and on lid. Light a large chimney starter of charcoal briquettes (80 to 100) and pour them evenly over 1 side of bottom rack (you will have a double or triple layer of briquettes). When charcoal turns grayish white (after 15 to 20 minutes) and you can hold your hand 5 inches above rack for 3 to 4 seconds, sear chicken breasts, starting with skin sides down, on a lightly oiled rack over coals, uncovered, turning once, until well browned, 5 to 6 minutes total. Move browned chicken breasts to side of grill with no coals and cook, covered with lid, turning over occasionally, until just cooked through, 12 to 15 minutes more. Preheat all burners on high, covered, 10 minutes, then adjust heat to medium high heat. Sear chicken on lightly oiled grill rack, lid down, until well browned, about 3 minutes per side. Turn off 1 burner (middle burner if there are 3) and arrange all seared chicken on rack above shut-off burner. Cook seared chicken, covered with lid, turning over once, until just cooked through, 10 to 15 minutes. Internal temperature should be 160 degrees. Transfer hot grilled chicken to large bowl with lime vinaigrette and turn to coat. Leave in bowl 5 minutes, then transfer to a platter and loosely cover with foil. Toss together mesclun, basil, tomato mixture and salt to taste. Slice chicken and arrange over salad. Drizzle with some lime vinaigrette and serve. *Note: I used 2 boneless skinless chicken breasts and cut the lime vinaigrette in half.